Public Poetry — which was just named the best reading series in Houston by the Houston Press– offers up its next event on Saturday, October 1, 2011 at 2 pm at Discovery Green park in downtown Houston. To kick off the event, there will be a performance by The Mighty Orq. 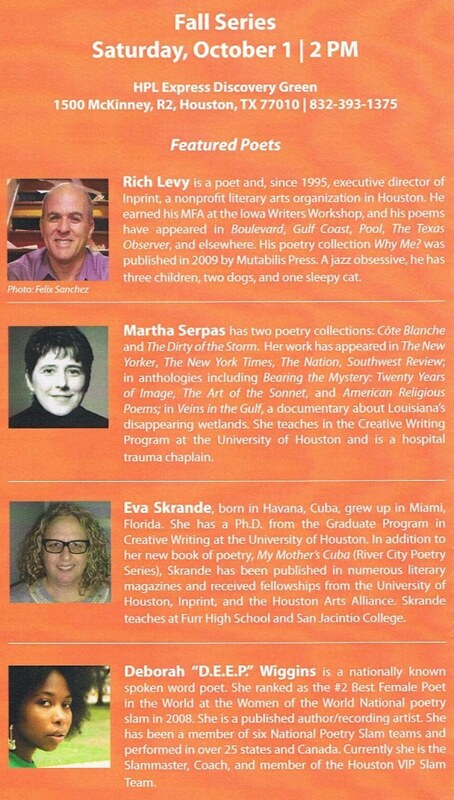 The featured poets will be Rich Levy, Martha Serpas, Eva Skrande, and Deborah “DEEP” Wiggins Mouton. WITS Third grader Helena de la Cruz will join the group. The reading is provided in partnership with the Houston Public Library. It is a free event, and the public is welcome.